Dempster walked away from the game he loved prior to the 2014 season. He had signed a two year contract with the Boston Red Sox after the 2012 season. He just did not think his back would hold up and left 13 million dollars on the table. But pitching a few innings in the WBC for his home country was enough to lure him back into uniform. He did not fare very well as Team Dominican Republic roughed him up. But the most productive and effective seasons for Dempster were in a Chicago Cubs jersey. Ryan Dempster began his major league baseball career for the Texas Rangers. He was drafted in the third round of the 1995 amateur draft. On August 8, 1996 the Rangers traded Dempster and Rick Helling to the Florida Marlins for John Burkett. He made his major league debut on May 23, 1998 against the Pittsburgh Pirates. Ironically, his first start came against the Cubs on June 1, 1998. The Cubs shelled him. He went 1.1 innings and gave up 5 runs on 4 hits(including 2 home runs). On July 11, 2002 the Marlins traded him to the Reds for Juan Encarnación, Wilton Guerrero, and Ryan Snare. In August of 2003 Demspter went on the disabled list as he needed Tommy John surgery. 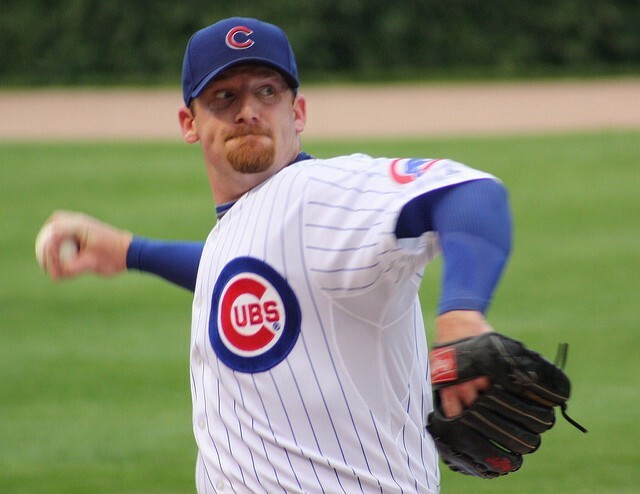 On January 21, 2004 Dempster inked a free agent contract with the Chicago Cubs. He spent all of the spring and a better part of that first season in Chicago rehabbing from his surgery. He finally toed the rubber in a Cubs uniform on August 1, 2004. He appeared in 23 games that year, all out of the bullpen in a relief role. Dempster started the 2005 season in the rotation and made 6 starts. But after his 6th start he was named the closer for the pitching staff, replacing La Troy Hawkins. In 35 save opportunities he succeeded 33 times. In both blown saves he collected the win. He led the league in save percentage. He is the only Cub and one of three players all time to both start a game and close a game in the same season. On October 1, 2005 signed a contract to stay with the Cubs through 2008 for 15.5 million dollars. In 2007 he was one of the most consistent pitchers out of the pen. There was consideration putting him back in the rotation by Lou Piniella but the inconsistency of the relief corp forced Lou’s hand and Demp remained in the pen. During spring training 2008 Dempster’s performance earned him the 3rd spot in the starting rotation. The closers role went to Kerry Wood. He started the season 10–0 at home. He was the first to do that in 31 seasons. Dempster finished the season with a 17–6 record, with 2.96 ERA and 183 strikeouts in 201 & 2/3 innings. The Cubs went to the postseason that year facing the Los Angeles Dodgers. Dempster made one appearance and surrendered a grand slam to James Loney. Following the 2008 campaign Dempster again resigned with the Cubs. The new contract was a 4y/52M deal. In 2012 Ryan Dempster told the front office that if trading him at the deadline would help the team he was willing. As a result he was traded to the Texas Rangers for two minor leaguers. Kyle Hendricks was one of those two and needless to say that worked out pretty well. Dempster won a World Series championship with the Boston Red Sox in 2013 and then walked away from the game. Ryan Dempster saved 87 games and won 67 games in a Cubs uniform. He finished his career with a 19.3 WAR and a 1.432 WHIP. He threw a total 2387 innings and struck out 2075 batters in his career. Ryan Dempster officially retired on October 8, 2014. On December 5th it was officially announced he would join the Cubs front office as an assistant to GM Jed Hoyer and President of baseball operations Theo Epstein. Ryan Dempster is one of the good guys in the game. His laid back attitude and sense of humor endeared him to fans and teammates alike. He works for the Major League Baseball Network and is a regular at CubsCon. But maybe he is best known for his ability to channel Harry Caray.